Gus has all CHs in his impressive pedigree and very good health clearances. ALWAYS happy and loves people. Check out our AVAILABLE ADULT link. J.J. won best of show at 9mos old, became CHAMPION at 12 mos old. He is a kind, wonderful, gentle, and well mannered springer. J.J. is retired. Winston is Champion sired. 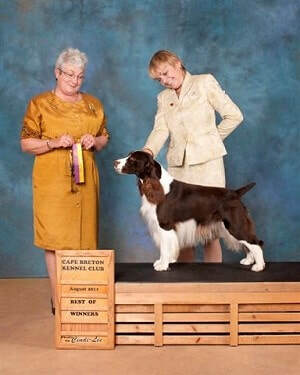 His sire is our Champion J. J. and his Dam is Duncan's Dashing Diva of Downs Lake CD BN RA CGC. As you can see, she has many titles. and looks. Such a lover. Gentle, kind and . likes everyone.